This article by Alison Payne appeared in Scottish Policy Now. While the new powers due to be devolved to Scotland under the Scotland Act 2016 are to be welcomed, it is important not to overstate the opportunities they bring. While the rates and bands of income tax are being devolved, income tax on dividends and savings, as well as control over the personal allowance, remain at Westminster. With only one major tax, there is very little scope for reforming the tax system in Scotland, especially as that tax isn’t even being devolved in full. As the pie-chart below illustrates, when the measures in the Scotland Act are implemented 69% of all tax revenue raised by the Scottish Parliament will be from a single source. This over reliance on Income Tax offers little scope to effect real reform and so limits the opportunity to create a better environment for economic growth. Indeed, it is because of this over-reliance on a single source of revenue that Reform Scotland has urged the Scottish Government to peg Income Tax to the UK rate until it has control over a more varied basket of taxes. As a result, Reform Scotland believes that the only way to enable the Scottish Government to create a different approach to tax, or to reform the system, is with the devolution of further taxes. We have continually argued that the Scottish Parliament should be responsible for raising what it spends and believe far more tax powers can, and should, be devolved. While we appreciate that another Scotland Bill to devolve greater powers is unlikely to happen in the short term, particularly while Brexit and, potentially, a second independence referendum are being debated and negotiated, there is no reason why the UK Government could not indicate now that VAT would be devolved to Scotland in full following Brexit. 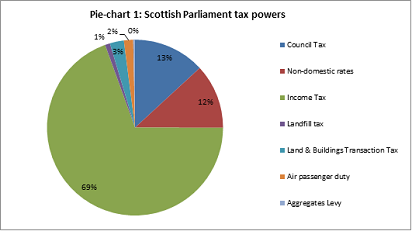 Pie-chart 1 did not include revenue from Scotland’s assigned VAT revenue because 50% of VAT receipts are simply assigned to the Scottish Parliament and so it is still a reserved tax controlled at Westminster. VAT revenues were assigned to Scotland because it would give the Scottish Government an incentive to find ways to increase those revenues, but the ability to vary the rate could not be devolved because it was not allowed under EU law. By assigning VAT revenue the UK Government recognised the benefit another tax would bring to the Scottish Parliament. However, without control over that tax, there is no ability for the Scottish Government to look at reform and ways to encourage economic growth. If the argument has been accepted that VAT is a useful tax for Scotland to have, but it could not be devolved due to EU law, once the UK leaves the EU there is no reason why it could not be devolved in full. Devolution of VAT in full would also enable the Scottish Government to directly address a number of issues regarding the application of VAT in Scotland, especially with regard to Police Scotland. 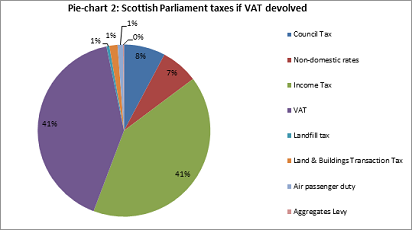 If VAT was devolved, there would be a broader basket of tax powers, as illustrated in pie-chart 2 below, enabling some elements of reform to be considered. While, it would not go as far as Reform Scotland would like, it should certainly be the next step.